My wife and I have been into Willys for 8 yrs. found our '55 in Tonapaw,Nev.,paid $900. and towed it 500 miles home. Spent about a year and $5,000 reconditioning it (restored to me means completely rebuilt to orginal spec's). 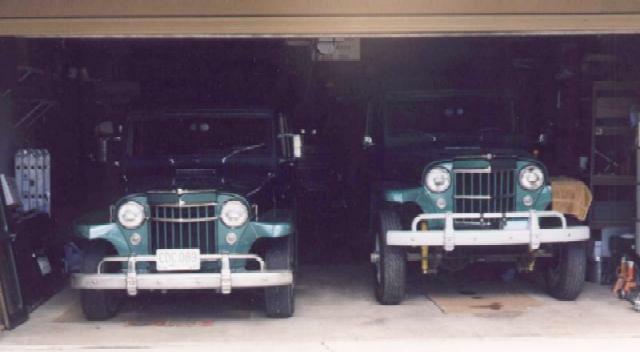 We own another 2wd '55 and a'50 cj3a, both are reconditioned. Have many pictures and orphand rigs too. The wagon pictured has a L6-226, T-90, mdl.-18, Warn O.D., Dana 27 front. Dana 44 rear both 4.88's and P'lok'd, A/S 7.50x16 radials. Still 6V and running Willys radio. 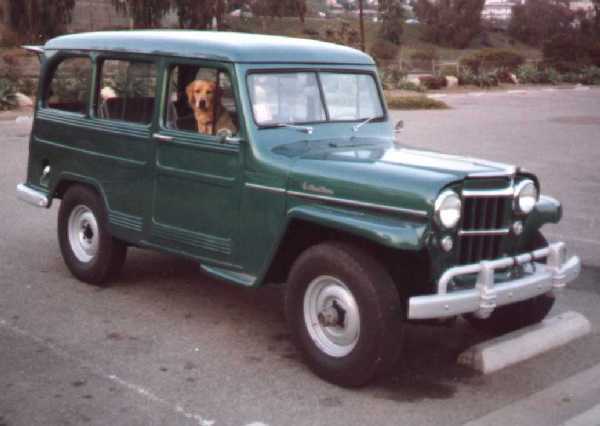 Other optional equipement include s.s. wind wing dividers, rear heater (in panel under driver side slider window), foot rest bars for back seat passengers, s.s. dash trim, aluminum deluxe tag on heater and two really cool brass oval badges that say "JEEP" product of Willys-Overland. Most were salvaged from early (flat nose 2wd) wagon that I've never seen the likes of in 10 yrs.a junk yard hunting. The bumpers and wheels are powder painted (some day chrome?$). No headliner or firewall insulation. It's a good driver and my only comment to those rebuilding one: I spent many years searching the N.W. for parts as a hobby. Wagons are very rare in wrecking yards now and buying at today's used retail prices, you'll spend way more than you'll recover. Ben & Laura's other Willys is at C19.